Join the DxE Open Rescue team as we rescue a little bird named Ava. Featured at the Sundance Film Festival. Whole Foods: Stop torturing hens! Investigations by DxE have found immense suffering and filth at Whole Foods farms. Ask the Whole Foods CEO John Mackey to end the exploitation of animals like Ava. Thank you for demanding that Whole Foods stop sourcing eggs from farms that abuse birds! Ava and hens like her need your support. In both caged and cage-free barns, birds at this Whole Foods supplier were forced to endure filthy conditions and intensive confinement. Ava and other birds at the farm faced abuse so horrendous that many were unable to eat or walk. Ava’s feet were so grotesquely deformed that they looked like pancakes. Starving and unable to stand, Ava and thousands of other birds were on the brink of death. Until DxE arrived. Hens today have been bred and modified to lay 250-300 eggs per year. Historically, they only laid 10-15 eggs annually. Despite what is marketed by industry; being "cage-free" means little for the hens used for eggs. 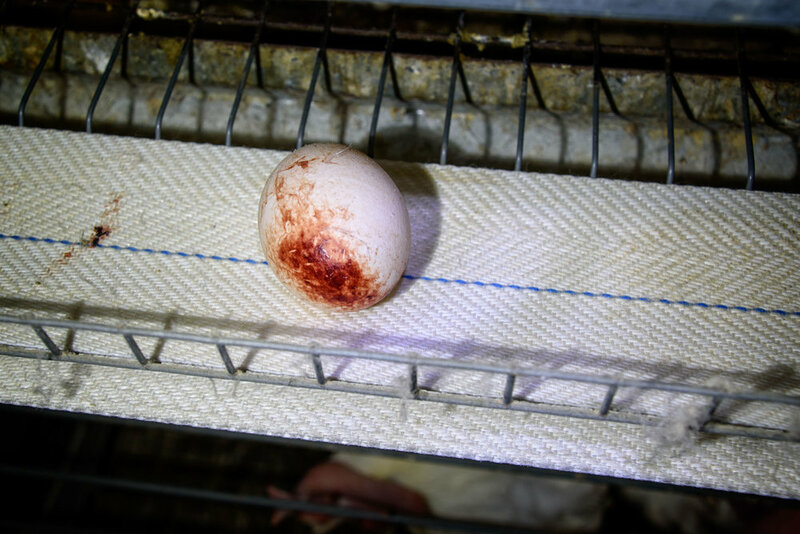 Another bloody egg - a product of forcing hens to lay eggs many times what they naturally do in the wild. Open Rescue Activists Priya Sawhney and Sara Muniz in front of Condition One's Virtual Reality camera. Experience Ava's story in groundbreaking virtual reality via production company Condition One (download their new virtual reality app) or by visiting the Berkeley Animal Rights Center. For the first time in her life, Ava’s life is free of constant fear. She has access to food and water, and will never be trampled on again. Ava lived her entire life in a cage. But now, even with her disabled feet, she ranges many acres on a beautiful sanctuary. She loves to peck at anything green! Ava never knew friendship or experienced new foods or warm baths. For the rest of her life, she’ll experience the joy that every animal deserves. While Ava is now safe and recovering at a sanctuary, there are countless more girls like her who need our voice. Take action now! Veterinary care, equipment, and campaigns are expensive. We can only save animals like Ava with your help!